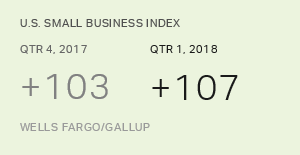 WASHINGTON, D.C. -- U.S. small-business owners are more optimistic now than at any point in the 15-year history of the Wells Fargo/Gallup Small Business Index. In the latest quarterly survey, which measures small-business owners' attitudes about a wide variety of factors affecting their businesses, the overall index score is +118. This is higher than prior 2018 measures -- with Quarter 2, 2018, at +106 and Quarter 1 at +107. The index now sits just above the record-high +114 from 2006. 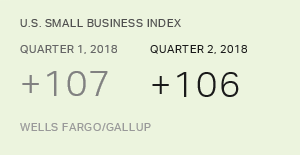 Current financial situation -- 78% of small-business owners rate it as very or somewhat good, compared with 73% in the second quarter of 2018. Cash flow in the past 12 months -- 69% rate it as very or somewhat good, versus 63% in the second quarter. Cash flow expectations in the next 12 months -- 77% very or somewhat good, compared with 72% last quarter. Credit availability in the next 12 months -- 49% say it will be very or somewhat easy to get credit, versus 44% in the second quarter. The Wells Fargo/Gallup Small Business Index includes an open-ended question asking small-business owners to name the most important challenge facing their businesses. In the current update, owners remain more likely to say that hiring poses a greater challenge than any other single issue, with 18% citing this as their top concern. Hiring is the only issue cited by at least 10% of owners. In a separate question, 26% of owners say the number of jobs at their company increased over the past 12 months, up slightly from 24% last quarter and the highest in the history of the index. Meanwhile, only 8% of owners say the number of jobs at their business decreased over the past year, standing in sharp contrast to the high point of 35% who reported decreasing employment in the first quarter of 2010. When individual response categories to the "most important challenge" question are combined into broader themes, more owners mention issues relating to government policies and regulations (24%) than any other such grouping. This broad category includes mentions of government regulations, taxes, and the government in general. In addition to hiring concerns, owners are next-most likely to cite economic issues (15%), which include the challenge of attracting new customers and the economy in general. In addition, 15% mention financial issues -- including costs and fees, financial stability, bill paying, and credit. Another 13% mention marketplace issues such as competition, marketing and products. 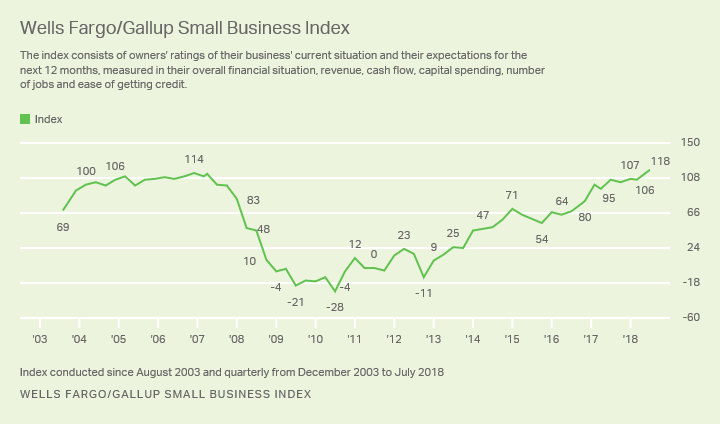 Small-business owners are clearly feeling positive about their current situation -- with record-high ratings on cash flows and overall improvements in their financial situation driving their optimism. Yet the improved economy has its downsides, manifested by owners' concerns over being able to find, hire and retain qualified employees. Given businesses' potential growth and an overall strong economy, ensuring that they have the workers/qualified employees to maintain that potential growth is key. Results are based on telephone interviews with a random sample of 604 U.S. small-business owners in all 50 states, conducted July 11-18, 2018. For results based on the total sample of small-business owners, the margin of sampling error is ±4 percentage points at the 95% confidence level. 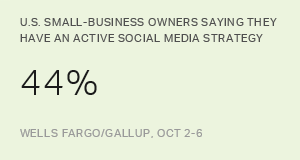 Small-business owners remain optimistic, but have hiring concerns. Owners' views of the tax reform law are mixed; many say it is too early to judge its effect. Small-business owners post their highest optimism score since 2007, buoyed by strong revenues and cash flow.